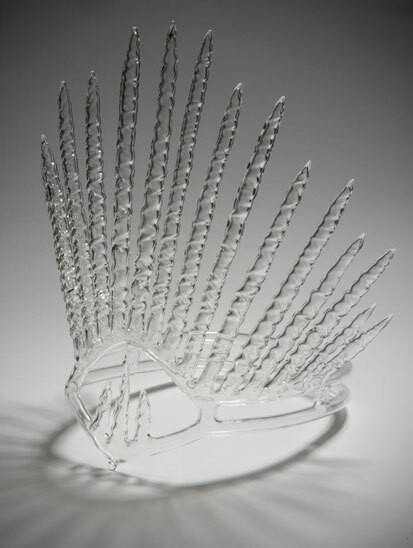 VisitScotland revealed a very special homage to the winter season 2009 - a sparkling Winter White tiara, inspired by everything white, wintery, wild and wonderful Scotland has to offer. The stunning piece was specially commissioned to celebrate the launch of VisitScotland’s £1.3million Winter White campaign, the national tourism organisation’s seasonal marketing drive to inspire more visitors to come to Scotland during the traditionally quieter winter months. Set against the breathtaking backdrop of The Great Hall in Edinburgh Castle, the icy glass headpiece was created by talented Edinburgh College of Art student, Julia Malle.